The Gypsy Moth is an insect pest found throughout North America, is a species that defoliates or eats the leaves from trees in its caterpillar or larvae stage. In large numbers, the Gypsy Moth can eat a large amount of leaves causing trees to be more vulnerable to disease and attack from other insects. Generally, defoliation (insects feeding on leaves) stops in early summer and should not have a long term impact on trees if the trees are healthy and well cared for. 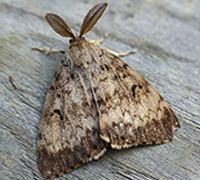 The European Gypsy Moth is considered to be a major pest in North America. In the caterpillar or larva stage, the insect eats the leaves of trees making them more susceptible to disease and damage from other insects. How much damage can the Gypsy Moth cause to trees? Depending on how much of the tree is infested, damage can range from light to almost complete defoliation or loss of leaves. In some situations, if the tree has been weakened or stressed by other conditions, the tree may die. What kinds of trees are most affected by the Gypsy Moth caterpillar? Gypsy Moth prefers oak trees but will eat all kinds of hardwoods including elm, birch, poplar and willow trees. In some rare cases, when the number of Gypsy Moths is extremely high, the caterpillar will attack evergreens such as pine and spruce. They do not appear to like sycamore, butternut, black walnut, dogwood or balsam fir. What is the lifecycle of the Gypsy Moth? The moths are seen in mid-summer and exist only to mate. Both sexes die after the female lays its eggs on the limbs and trunks of trees, on rocks, buildings or in other sheltered areas. The egg masses remain in place all winter and hatch the following spring from late April to mid-May. Once hatched the caterpillars begin to feed for approximately seven weeks. Are there any natural predators to the Gypsy Moth? Yes. Predators include other insects like wasps, flies, beetles, ants and spiders and animals such as chipmunks, squirrels and raccoons. When caterpillars first hatch, birds such as chickadees, blue jays, robins and nuthatches will prey on them. Gypsy Moth populations are also reduced by diseases caused by bacteria, fungi and viruses. Gypsy Moths have been in the City of Mississauga for many decades. There was a large increase in its numbers in 2006 and 2007. Its numbers returned to lower, normal levels in later years. In 2013 and 2014 during the fall and winter months, the City surveyed egg masses on City owned streets, parks and woodlot areas. The results showed that the number of Gypsy Moths were at a manageable level. To help manage future populations, the City is using Integrated Pest Management (IPM) measures. IPM is a sustainable approach to managing pests by combining biological, cultural, physical, and chemical tools in a way that minimizes economic, health, and environmental risks. Learn more about Integrated Pest Management techniques here. Forestry staff will continue to hold workshops and distribute traps to inform residents about ways they can help protect trees. Watch for workshop dates and information on this website. Follow us on Twitter for regular updates. If you questions about Gypsy Moth and IPM please contact Forestry staff by email at Gypsy.Moth@mississauga.ca or by calling 3-1-1 (or 905-615-4311 if outside city limits). Forestry staff use Integrated Pest Management (IPM) techniques to determine the Gypsy Moth population. The City installs tree bands and/or burlap to selected City-owned Oak trees based on egg mass count and location. In July of each year, pheromone traps are placed in select City street trees, park trees and some woodlot locations to catch the male moths that are flying in search of females. The City will continue to conduct egg mass search(s) and remove them when possible. To help reduce Gypsy Moth damage in your neighbourhood, you can install tree bands or burlap wrap on your trees, and install Pheromone Traps in your trees. Each of these techniques will help to keep the population level of the Gypsy Moth at lower and more manageable level. The City needs the help of residents to control the Gypsy Moth population in Mississauga. If residents, especially those in neighbourhoods with a high number of oak trees, use IPM techniques on their own trees, working together, we can keep Gypsy Moth numbers at a manageable level. Contact an Arborist: Please call your local nursery or garden supply store for availability of the materials listed above. Learn more about these Integrated Pest Management techniques here.